A slight pause in the blog but the running (and a bit of walking) goes on. The Tuesday night group is getting well established with increasing numbers. We are now averaging around 5 miles and the pace has picked up a little, so overall a good workout. My own training has been focused on Tuesday nights and doing some rowing in the gym. The impact of this should be known shortly; we are planning a Parkrun and 10k before Christmas. My Parkrun PB is currently around 27 minutes so would be very good to break this. For 10k it is 51.59; I suspect that may be out of reach at the moment, but would be good to go close. We recently had a trip to Robin Hoods Bay, my post-birthday weekend away. We walked from there along to Ravenscar on the coast path/Cleveland Way, getting a good soaking to start off, but then the weather brightened up nicely and the rest of the coast path and return via the old railway track were beautiful, a lovely autumnal stroll. Below are a couple of shots of the rainbow over Robin Hood’s Bay. Sunday saw a trip to Bridlington to take part in the half marathon there. Unfortunately our race numbers had not arrived but on arrival at race HQ this was quickly sorted, and we sheltered in the pavilion for a while to escape the stiff breeze, though otherwise the weather was ideal, cool and cloudy. I was a little nervous about the race. Our training had been truncated by our holiday in September and more recently my cold, and I had not done the amount of miles I would have liked. Starting on the sea front promptly at 10, the route heads mainly uphill, though relatively gently, for the first half of the race, and then down back towards Bridlington for the next couple of miles, with a loop out to Sewerby Hall and then a finish along the cliff tops. The countryside sections are quite pleasant, and the cliff top section would be too had I not just run 11 miles. You can see the finish on th seafront clearly from the cliffs, but you are still nearly two miles from it so I tried to ignore it and keep my head down, only looking up when I was a few hundred yards from the end. I was delighted to finish in 2.10.14, which may be a personal best. (I ran the Greath North Run in 1999, 2001 and 2003 and it is possible one of these may have been better but cannot easily find the results online.) I think this was due to the good (for running) weather conditions and my refuelling strategy – I ate a large handful of sultanas at each of the drinks stations and these seemed to give me a boost. Post race (and fish and chips) photos below. We have another Parkrun and a 10k planned before Christmas, and I can approach these with confidence after this performance. A bad back and cold have severely curtailed half marathon preparations this week. I managed 4.5 miles on Tuesday but since then very little. I am easing back in and ran around 2 miles at a steady pace last night, which felt ok so ready to do something longer on Wednesday. Squash tonight but I need to take it fairly gently at this stage. I am considering entering an indoor rowing event in December. I have competed in a few in the past but not for a couple of years. I am putting together a training plan – I would like to break 7 minutes for 2000m and hopefully get somewhere close to 6.50 but that will be a challenge. Rowing is good cross training for running and it is quite an attractive option on cold wet evenings. I don’t mind running in bad weather; the first few minutes are always the worst and then it becomes quite enjoyable. Last Tuesday I was pleased that the Harriers regular social run was once more able to take place, after a gap of several weeks for us and some concern over its future. We ran a steady 4 mile route round Sowerby and Old Thirsk, good preparation for what was to come. On Thursday we headed down to Devon for a few days, knowing that we needed to do a 10 mile run at some point to keep our hopes of doing a half marathon alive. 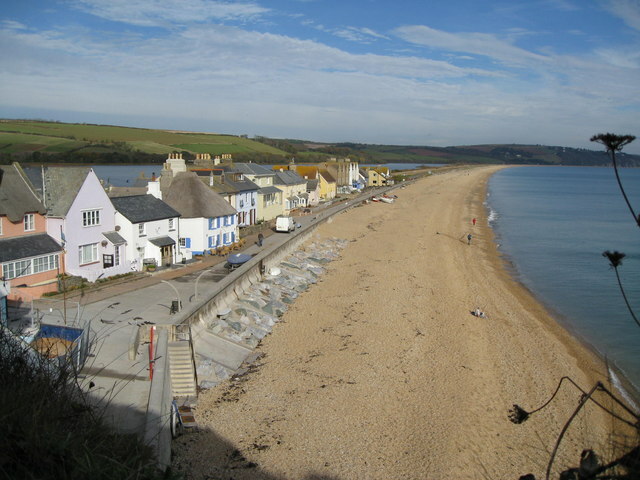 I plotted a route around the villages of Slapton and Torcross and we set off on a warm Saturday morning. The first part of the route was an inland hilly loop, after which we headed down to the coast road and along to the pretty seaside village of Torcross. Following this we ran a straight and level four miles to the far end of the Slapton Sands beach, and then headed back towards Slapton for another circuit of the hilly loop. By this time the hills and high temperatures were slowing me down, though Liz ran strongly right to the end. Overall it was a lovely run in beautiful scenery, but the last part was hard to enjoy. I always try to think during the tougher parts that this is the point of the training, so that the tough bits seem easier next time. We will see in a few weeks’ time. After a steady run round the streets of Thirsk last Tuesday, we again took on the Kilburn Woods route on Thursday evening. The evening began well as Gavin brought several boxes of mushrooms from the boot of his car and offered them around, a welcome if unexpected gift. Setting off at 7pm the first couple of miles were in daylight but after that the setting sun and the thick woodland meant that head torches were required. I had only done one head torch run before, across a lumpy field in the pouring rain with a hopeless torch. This time the torch was better and the paths reasonably good (and reasonably well known to us) so the going was much easier. We kept a reasonable pace and finished off with a drink in the Forresters, toasting Gavin and Hilary’s 24th wedding anniversary. On Sunday we needed to do a longer run, with a half marathon coming up shortly. We chose to make use of the good weather and drove to the top of Sutton Bank for a run along the scarp slope of the Hambleton Hills to Sneck Yate, loop around on the road and back to Sutton Bank, around 8 miles in total. It was a beautiful evening and the setting sun (and later rising moon) showed off the lovely scenery to great effect. The run was undulating but not too testing and we returned to the car just before darkness, with the temperature dropping rapidly. It was good initial preparation for the half marathon but some longer runs will be required over the next few weeks to get us through the 13 miles. Sorry for recent lack of posts, we have been away. My latest Parkrun on 6 September was not a great success, though really what my (lack of) preparation deserved, coming in at around 28 minutes. Conditions were good and of course the setting in the grounds of Fountains Abbey was beautiful as ever. 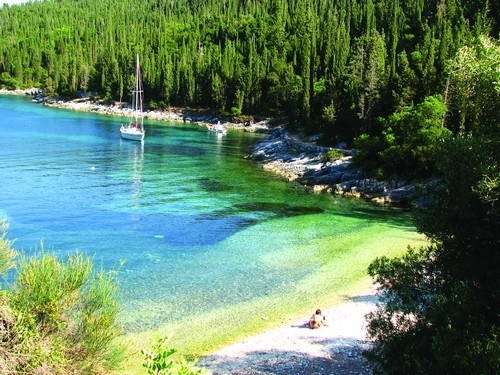 After this we went away, staying in the charming fishing village of Fiscardo on the north coast of Kefalonia in the Greek Islands. The weather as expected was great and we spent some time on the beach. We did however manage to fit in a few runs. The problem is that Fiscardo is surrounded by either sea or hills, so apart from a few hundred yards you are forced to run up some pretty steep gradients. We went in the early evening; even then it was pretty warm, but running past the lovely Foki beach (below) made it all seem bearable. Our route was fairly short, around 3 miles, but with the hills and heat fairly testing. Following our return on Saturday, on Sunday we headed to the slightly less picturesque seaside resort of Middlesbrough to do our Leadership in Running Fitness course. The sessions were lively and interesting, a good mix of practical and theory and overall I enjoyed the course. Now looking forward to putting some of the ideas into action. On the evening of Wednesday 26 August I took part in the Sessay Swift, a 6km road race in the small village of Sessay near Thirsk. The warm sunshine earlier in the day had faded and by the 7.30 start time conditions were good for running, cool with a gentle breeze. The route is fairly flat with some minor gradients and I set off at a fairly comfortable pace. I managed to pass a few other runners and was closing on another group when, rounding a bend close to the finish, I felt a sharp pain in my left foot. I kept going and the pain receeded, and I was pleased to cross the line in a time of 32.04, slightly faster than I had predicted. I think I had felt the benefit of two weeks of fairly good training, some interval sessions on the rowing machine and the good running conditions. The race overall was very well organised; congratulations to Marian and her team from Thirsk and Sowerby Harriers. Full results are here. The following day my foot was quite painful, and putting on shoes was difficult. Some ice (actually frozen peas) and ibuprofen over the last few days seems to have improved it, so much so that yesterday Liz and I went for a short walk in Swaledale, over Harker Hill near Reeth. The ling heather was in full bloom and the weather was overcast but bright, meaning that there were some lovely views up the dale towards Low Row and across to Calver Hill and Fremington Edge. Harker Hill itself is an easy ascent on good tracks, and I thought our walk would make a good but challenging running route at some point. We had a lovely run on the sun-dappled Kilburn Woods route on Sunday morning. The run has everything; hills, flat stretches, great views, fairly easy paths and at 6 miles is long enough for a really good work out. There were some muddy patches after heavy overnight rain, some well disguised, but nothing too serious. It was fairly hot in the sunny patches but cooler with a welcome breeze under the trees. I feel reasonably well prepared going into this week’s race, so let’s see whether my time bears this out. I am pleased with my new trail shoes, Asics Gel Tambora. They seem to give good grip, are reasonably lightweight and have a little more spring than some. We have entered an autumn half marathon so they should get plenty of miles between now and then. I try not to obsess too much about run times and distances. I use a normal watch rather than anything more sophisticated, so in a race I am reliant on distance markers and the watch to give me an idea of pace. For the upcoming Sessay Swift, with a distance of 6k, I have looked a the Runners World race time predictor and used my recent Parkrun times to predict my time. This is telling me that I should be running around 32.45 for 6k, or around 5.30 per km. This sounds like a sensible guide time, but as always I will try to set off at what I think is a fairly comfortable pace and press a little harder in the later stages if there is anything left in the tank. We enjoyed a good if damp run around Thirsk last night, just under 5 miles at a reasonable tempo pace with a couple of stops, good preparation for the race next Wednesday. It would be good to see a few more people turning out on Tuesday nights – the routes and company are always excellent, and running with a group is a great way to motivate yourself to get in some miles. We usually run around 5 miles at around 10 min mile pace, but no-one gets left behind and faster runners are welcome to head off in front and run back. The next Tuesday session is scheduled for 1 September (none next week as day before Sessay Swift). Picture below from Tuesday run a few weeks ago when we were blessed with better weather.